My husband, Bill, and I just happened to visit Eureka on their opening night after about a week of soft openings including a night when one of my team members was able to sample the menu and gave it her thumbs up. The entire space at Eureka is new and tastefully done in earth tones and they offer a small patio out front with misters for those warm summer days. We chose to dine at the bar inside where we ran into about a half dozen friends and associates. It seems that the word spreads quickly here in the desert when new food and drink is offered! Bill ordered the Catalina Island sourced Bison Burger with tri-color peppers, Bermuda onion, and smoked mozzarella, finished with their house made bacon infused jalapeno jam. Bill will tell you that this combination was one of the best Bison Burgers that he’s sampled and that the Bison makes for a healthier choice than a beef burger. I told Bill that if I were to have a burger this would likely be the place I’d have it. I went for the strawberry summer salad that featured grilled chicken over a bed of mixed greens tossed with you guessed it, strawberries, diced onion and tomato, cilantro, bleu cheese crumbles, candied pecans, basil and a strawberry vinaigrette dressing. Knowing that it’s my job to sample other fare and report back, I ordered a side of Eureka Truffle Fries. Good, rich and likely enough fries to feed three or four. And again in the interest of gathering information Bill and I shared a Golden Gate Butterscotch Pudding. This dessert was really tasty but a bit grainy which was really our only complaint during the evening. Eureka offers a nice selections of wines and a couple dozen craft beers on tap in addition to a full bar and a few specialty cocktails. No reservations at Eureka so it’s first come first served and I’ll add that the place was packed on our Monday visit. 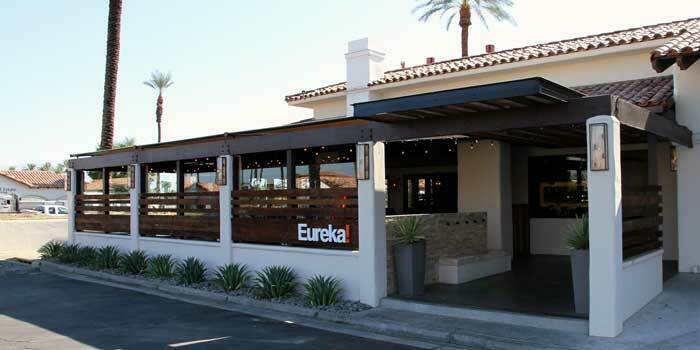 Eureka is located at 74985 Hwy 111, Indian Wells at the intersection of Cook and Hwy 111. (760) 834-7700. Be sure to say hello to Eureka's General Manager; Mika Tanimoto.